Well, since my Valentine's stamp collection is kinda non-existent, I'm having to be creative. I have a few things I can play with but the pickin's are indeed slim! As I sat brainstorming tonight, I remembered I had this cute little animal set from TAC. It's called Wild for You. 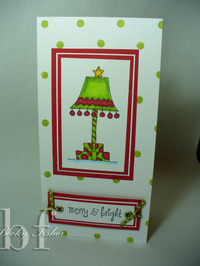 The paper I used is from the Mia's Cottage collection, both the printed and the cardstock. The baubles are from Stamping Bella. I filled a little grass in with my copic marker. Love Potion . . .
Back in October or so I posted a candy canister for Halloween. It was made from a recycled glow bracelet cardboard tube. Hayden, my four year old, loves glow sticks! His habit keeps me supplied with these little tubes. We buy them from the Dollar Tree in the toy section. They contain 15 bracelets and connectors. He has me connect two bracelets every night and hang them on his bed post. The paper was from my stash that I bought WAY earlier this year. I'm really trying hard to use my good stuff and stop being a "collector". The paper is from the Cupid collection from Sweetwater Scrapbook. The Love Potion stamp is from Savvy Stamps colored with Copic, of course. Wait! I have one more . . . Okay, this is my last Christmas post. Because I was late getting cards out to my friends, I waited to post this card. I didn't want to ruin the surprise if they had not received it before reading my blog. I think I'm in the clear. Anyhow, this is Wreathabella from Stamping Bella. Oh, how I could spend some dollars there! 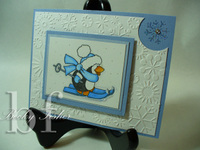 The little bauble is also from Stamping Bella. Let me just say this . . . More! Gotta have more! I am sticking those little baubles on EVERYTHING! Okay, back to business . . . Wreathabella is colored with Copic markers and the sentiment, also from Stamping Bella, is stamped in Palette Landscape. The cardstock is plain white cardstock, green bazzill, and red bazzill. 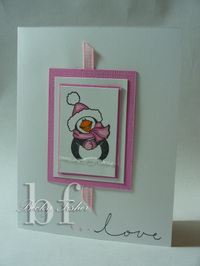 Again, I'm using the Perky Penguin stamp set from TAC. This time I used him for a Valentine's day card. I colored this little guy with my copic markers, added a piece of torn paper across the bottom of him and used a combination of stickles and glitter to create the snow at his feet. I added a single piece of pink gingham ribbon, a sentiment and a few little stickle dots at the bottom and called him complete. I made these for a monthly swap that I participate in and whipped 10 out in no time flat. Santa is coming in how many days? 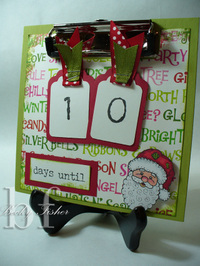 This cute little calendar was designed by my friend Joy. It's made using a chipboard clipboard and magnets under the background paper. Each number tag has a magnet on the back of it. All papers and stamps are from TAC. The santa is colored in using my copic markers. The unused number tags are neatly stored in a clear envelope that is affixed to the back of the clipboard. I took this picture several days ago as you can see from the countdown. I'm running a little behind with my posting. This past week was a real doozy for me, both at work and at home. William is finally home for Christmas. He'll be home with us for two full weeks before he's leaves for New Mexico again. The good news is that it looks like this will be his last trip out and then will be home for good. Yea! He's been traveling for almost 9 months now, so Hayden and I both are looking forward to this being his last trip. Here's another holiday card that I made several days ago. This stamp set was given to me by my friend Stephany when I visited her in San Antonio a couple of weeks ago. 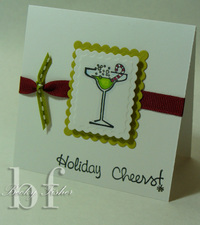 I just love cocktail stamps, especially holiday cocktails. This is a simple card using my nestabilities and copic markers. Last night was a lot of fun. I had two of my stampin' buddies over to play and play we did! As you can see, Jean, Selena and I had a very productive night but best of all we had fun! The bag on the left is a bag-a-lope and was stamped with the Christmatini stamp from Stamping Bella. 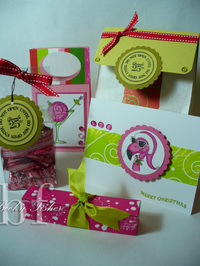 The baubles used on the bag-a-lope and flamingo Christmas card are also from Staming Bella. The bag on the right is made from a white lunch sack, trimmed down and backed with a piece of bazzill cardstock cut long enough to fold over and make a flap. The clear acetate box is from Lauren Meader. It is her Ghirardelli chocolate gift box. I didn't have any Ghirardelli's to put in it, so for the time being I filled it with Andes Mints. Dennis the Menace lives here. It's Friday night and I can already tell what kind of a weekend I will probably have. I left the office a little after five and headed over to pick Hayden up from daycare. He was in a fairly good mood but a little on the chatty side, which is not unusual. His little voice is always raspy because he talks so much. Anyway, as Hayden and I are driving home, singing, talking, and counting we pull into the turning lane that takes us to our subdivision. I guess I was so wrapped up in all the entertainment in the car that I didn't realize the turning lane light wasn't working and sat through 3 light cycles before catching on. After maneuvering through traffic and u-turning, we made it home. Hayden immediately ran to his room and put his jammies on (yes, we put our jammies on before bath and dinner). He would wear his jammies 24/7 if I would let him. While Hayden is slipping into something more comfortable, I am ordering pizza for dinner. After I get the pizza ordered and I'm told delivery time is running about an hour and 15 minutes, I get a call from my friend Stephany. I'm on the phone with her for maybe 10 minutes when I realize Hayden is VERY quiet. A quiet 4 year old usually means T R O U B L E! I peek around the corner into the living room and there sits Hayden in front of the Christmas tree with half of the Christmas presents ripped open. He didn't take any of them out from under the tree but managed to rip 'em up pretty good. It was one of those times where you don't know if you want to laugh or be mad. Lucky for him, I just didn't have it in me to get mad. It's 10:45 p.m. and he's been asleep for almost an hour and I'm exhausted. Since I am too tired to stamp tonight, I thought I'd share a card I made the other night. 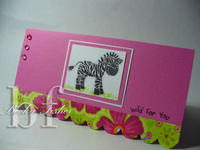 I used my Cuttle Bug embossing folder, Bazzill cardstock, Copic Markers, sparkle embossing powder. The little penguin is from the Perky Penguin TAC hostess set. Santa visited my house early! Ho ho ho a shopping I did go! What a wonderful feeling it is when you get home from a long tiring day at work, check the mail and find a yummy little package from Stamping Bella. I quickly did my chores, fed and bathed Hayden, threw some jammies on him (and me), put him to bed and began playing with my new goodies. Oh how I do love this little ornamenty lamp. Is it just not the cutest! I used white cardstock, stamped with a pencil eraser dipped in Tea Leaves VersaMagic ink, red bazzill, copic markers and large eyelets. The sentiment is also from Stamping Bella. If you have seen last year's TAC catalog, you may recognize this layout. I had the privilege of designing a two-page layout in last year's catalog and this is one of the scrapbook pages I designed. This is truly one of my favorite pictures of Hayden and Cleo. Hayden was 14 months old in this picture and literally spent the afternoon crawling all over her. I just sat with my camera as they played. If you've never owned a Saint, I have to tell you, they are the biggest, gentlest love bugs! Unfortunately Cleo is no longer with us. We lost her to bone cancer last year. She was the 2nd St. Bernard we owned and was a rescue. We have since adopted a crazy collie named Dodger. He, too, is a rescue. I have to tell you, collies are a little different than St. Bernards! He's a little on the "active" side but Dodger has been an incredible puppy! He and Hayden are big-time buds! I'm in the moo-ood for love! I thought I'd jump ahead a little tonight and start thinking about Valentine's Day, which is just around the corner AND one of my favorite holidays! Last year while I was in San Antonio visiting some of my stamping pals, we made a trip to Stamp Antonio. They have everything under the sun for rubber stamping and paper crafting . . . best of all they carry Amuse rubber stamps. I had bought the cow stamp about two years ago from the Michael's dollar bin. 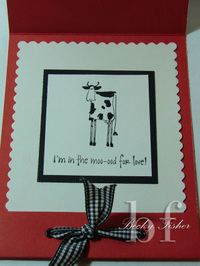 I came across the "I'm in the moo-ood for love stamp" at Stamp Antonio. I had to have it to use with my cow stamp!! The matchbook card was bought in a package of red and white cards and envelopes that were on clearance after Christmas last year. When I'm hitting the after-holiday clearances, I aways try to think outside the box. Sometimes it pays off! I used my grommet tool and a large red grommet for the little window that my cow is peeking out of. Isn't he adorable!